When my sis and I were little, we got together with two kids next door and decided to dig to China. We’d never been to China. We didn’t know anyone over there. But it seemed like a worthwhile endeavor. Something we all could do without bothering our folks. Armed with a small shovel, we commenced to turn over the earth in a spot somewhere along our adjoining property line. When one got tired, another would take over. Now it seems a shame to dig up perfectly good Kentucky Bluegrass on a whim, but back then, we had a goal. What we were going to do when we found it was never considered. The deeper we dug, the blacker the soil and the more interesting the creatures we found. Lots of earthworms, probably wondering why four kids were interfering with their aereating. As summer turned into fall and we all headed back to school, we abandoned the dig. It wouldn’t be long before we had to focus on homework and eventually, winter snow would make the soil too hard to remove with a mere shovel. As I recall, the hole remained, testament to four kids’ ambitious hopes. It was perhaps a foot deep and no wider at its surface than another foot. But we’d had fun, and none of our parents dared fill the hole. The city’s street department has been doing some work in our neighborhood. Digging up huge slabs of street, repairing what’s beneath, pouring concrete, resurfacing with fresh oil and rock chips, and replacing some worn sidewalks along the way. It’s an interesting process, but even more interesting was the sudden realization that we kids were doomed to fail at digging to China. We just didn’t have the right equipment. We needed one of these thingamajigs instead! 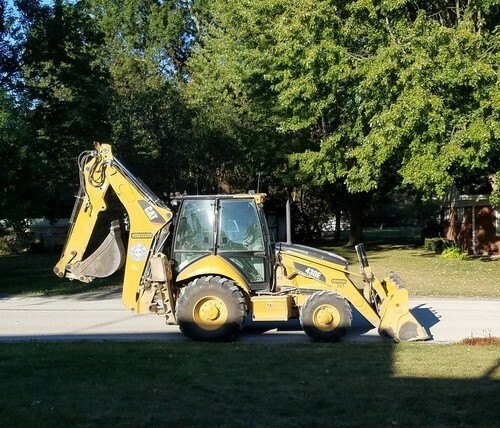 This entry was posted in Uncategorized and tagged better equipment, digging, kids playing. Bookmark the permalink. Ha. Well, I am sure you would have enjoyed the sites if not the food! Cole spent many a happy hour digging to China. We even packed snacks for him –every adventurer needs snacks! Those thingamajigs have been around our neighborhood for months as they shore up Chicago’s infrastructure. A very slow progress. When one of the guys rode one across a patch of my lawn—I chased him down shouting like a fisherman’s wife. What on earth was he thinking? Cole on the other hand made friends and asked for a ride. Happy Day. Great weather in Chicago! P.S. Didn’t you dad “the fixer” ever tell you it is ALL ABOUT THE TOOLS and several million trips to Home Depot??? My dad loved tools, but, bless his heart, he was woefully inept with them. Everything Domer has learned about fixing stuff has been from YouTube and trial-and-error! I’m glad I’m not the only one with plans of digging to China. We had a lot of fun with that, dreaming about the things we’d see there. Snacks?? What a good mom you were! We’d have probably made it to China if we’d had snacks!! Kb, I can imagine you chasing one of these road things across your lawn — and Cole snatching a ride! Great mental picture, that!! We used to dig deep holes and then cover them over with cardboard or whatever. I can still smell the earth and feel the coolness way down there. Happy Weekend Debbie. Thanks, John. What is it about the unknown that fascinates us? I’m pretty squeamish over digging in the dirt now — all those BUGS! — but I didn’t mind as a kid. And I’d forgotten about how cool it became the deeper we got! We did have some parent concerns when we got deep enough to stand up. Wow, you really *did* dig a hole!! We did. :-). One time if filled with water during a rain storm so we took off the roof and jumped in. Hey! If machines can move big trees, they certainly could dig to China. I don’t remember ever being a digger. I was more likely to be the one floating leaf boats in the gutter after a rain. But I like your persistence, and I like even more the fact that your hole was allowed to remain. The advice that shows up on Pinterest and elsewhere is, “If you find yourself in a hole, stop digging.” But of course, if your goal is to tunnel into a brand new world, digging is exactly what you want to do! I had a neighbor younger than I who would spend HOURS on his haunches, watching bugs in the yard. I guess our differences show up early. I never became a digger (well, maybe I did, of facts! ), and you became a boat enthusiast. I’m not sure about my neighbor, but he was brilliant so who knows? I like the idea of our hole still being there, too. The only part that concerns me now is wondering how many folks have inadvertently tripped in it, especially when it’s covered by snow. Australia? Now that would have been grand! At least I’d have had a prayer of understanding the language, ha! So you were a digger, too? Gee, can you imagine today’s kids spending hours digging a hole in the ground?! I can hear Domer now — he’d probably ask why we didn’t just Google it if we were so interested! As for the upside-down stuff, I still like to lie on my back and pretend I’m walking on the ceiling! I wouldn’t take a hundred bucks for those childhood memories, Dawn! We had a blast, and part of me feels sorry for today’s kids — all wired up and alone. For the record, I always wanted a tree house!! We were told that if we kept on digging we’d find the Devil. ” but even more interesting was the sudden realization that we kids were doomed to fail at digging to China. We just didn’t have the right equipment. Charming, clever, amusing, and well-written post, my friend. Thoroughly enjoyed! P.S We finally got some nice cool Autumn weather today. I’m VERY happy!!!!! Ron, you must be busy packing — I haven’t heard from you in a while. Hope it’s going smoothly! We’ve been having some lovely cool weather — down into the 40s at night. Of course, it’s going to warm up a bit next week, but I’m enjoying my candy corn while it’s here! Glad you enjoyed this one. We spent many a happy day on our dig — surprising, since we really didn’t seem to get very far. Still, it kept us out of our mom’s hair, and I’m sure she thought that was worthwhile! I enjoyed this fun post, Debbie, and relived some of my childhood memories too. It was my cousin and I back in those days doing things and building things. I think childhood is much more fun than being a grownup, ha ha! Too bad we don’t allow ourselves to do some of the things we did as kids, right? Not that I’d particularly like to go back and dig a hole, but isn’t that what gardening is all about, ha?!! Yep, dug to China many times. Never made it. I think it’s pretty cool how kids and adults have similar experiences in common. You,, too? Don’t you just love the thought that so many of us, scattered all across the globe, were doing some of the same fun things at the same time? !